Prolimatech shows off the Lynx, a new budget cooler that retails for 27.90EUR. The cooler has a copper base, three copper heatpipes and an aluminium fin array that is cooled by a 120mm fan. The cooling specialist Prolimatech is expanding their diverse line-up of coolers further after the successful Panther launch. Their latest CPU cooler by the name Lynx aims to take the entry level by storm, offering excellent compatibility and bundling a 120 mm PWM equipped fan right out of the box. The manufacturer Prolimatech is known for high performance and silent cooling solutions like the Megahalems, Armageddon and Genesis. Their newest unit is incredibly compact and intended to appease the budget user. Called Prolimatech Lynx, it delivers the most cooling possible combined with a size that ensures maximum compatibility. With a mere height of 159.5 mm and depth of 30 mm, the CPU cooler still features three heatpipes embedded in the base plate which is made of copper. The pipe transport the heat to the large number of Aluminum fins. Both the base and heatpipes have been Nickel plated, to offer the high quality for which Prolimatech is known for, while also acting as protection against corrosion. The included 120 mm PWM fan is to be attached to the body of fins with simple metal clips, with a additional such pair included for those intending to use the Lynx with a second cooling fan. The included unit offers a rotation speed from 800 to 1600 RPM. Thanks to its compact size, the Lynx only weighs 354 grams by itself and 487 grams with the fan installed. Thus, the unit does not put a strain on a motherboard and is perfect for those moving their system around frequently. The backplate ensures that the Lynx can be attached properly and unfolds its cooling potential. Prolimatech has designed the cooler in such a way, that it fits the Intel 1155 and 1156 as well as AMD AM2, AM2+, AM3 and AM3+ sockets. 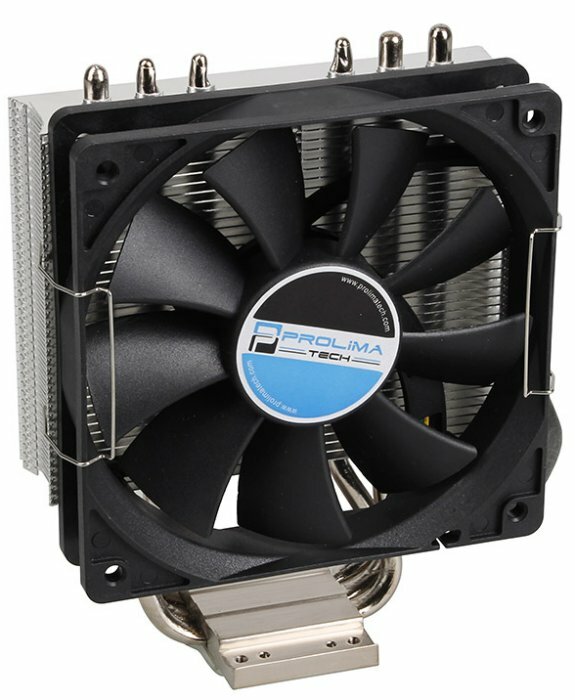 The Prolimatech Lynx CPU-Cooler is available immediately for a mere 27.90 Euro exclusively at www.caseking.de.